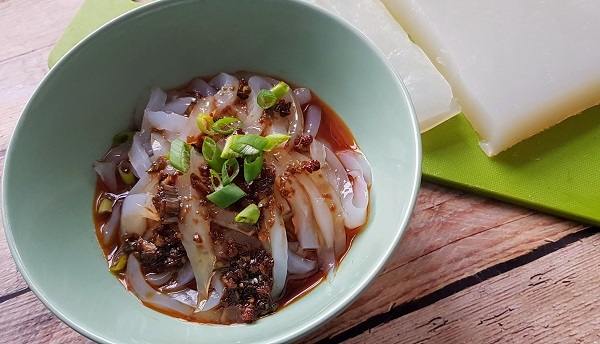 A few weeks back, an interesting Facebook video on Szechuan mung bean jelly noodles caught my attention; since I had several packs of mung bean flour in my pantry, I decided to attempt making it during my Live Asian Kitchen broadcast on Twitch. The mung bean flour packs I had are actually what’s called Tepung Hoen Kwe and they contain vanilla essence, since they’re used for making Malaysian and Indonesian sweet kuihs (snacks). I decided to wing it rather than try to hunt down some unadulterated mung bean flour, and it turned out just fine; no trace of vanilla came through in the final product. Mix the mung bean flour with 1 cup of water. Bring the rest of the water to a boil, then reduce to a simmer. Stir in the mung bean flour mixture and cook until it turns translucent and is of a starchy consistency. Pour into a mould and allow to cool completely; it took mine about 60-90 minutes to set, with some help from the refrigerator. Cut into thin strips with a knife; if not using immediately, soak in cold water to prevent them from sticking. Heat oil in a pan, then saute the minced garlic. Add the remaining sauce ingredients, mix well and remove from heat. 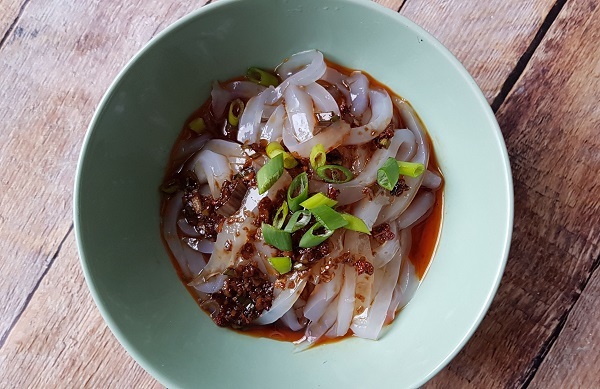 Serve noodles with sauce, spring onion and fresh coriander.